REDDITCH Operatic Society (ROS) is bringing one of the world’s most popular musicals to the Palace Theatre and this is your chance to be part of it. 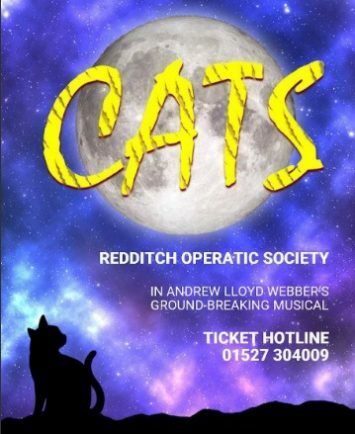 Members are on the look out for twinkle-toed tomcats and malleable moggies to join them in the premiere of Andrew Lloyd-Webber’s theatrical masterpiece, ‘Cats’. Talented locals could be in with a chance of landing iconic roles such as magical Mr Mistoffelees, Grizabella, Bustopher Jones or Old Deuteronomy. ROS is inviting people who might be interested to join them at its ‘Cats Introduction Night’ at Community House, 103 Easmore Road, on Tuesday, April 9. Running from 7.45pm, it will provide an opportunity for people to find out more about the show – which runs for five nights between November 19 and 23. Tony Jay, ROS Chairman, said: “We are celebrating 60 years of ROS this year – and what a way to celebrate! “Cats is one the most ground-breaking musicals of all time. “There will be fabulous costumes, furry features, lycra and plenty of face paint, and we can’t wait to get our paws stuck into it. Interested parties can get in touch via the society’s Facebook page ‘Redditch Operatic Society’, by emailing tony@redditch-operatic.co.uk or by calling 01527 455001.